I am currently reading the book, "Year of Yes" by Shonda Rhimes, which I highly recommend although it isn't at all what I thought it would be! For those who know me, saying yes is an actual problem for me, I often say yes too often and some may think that I need to read a book called "Year of No!" LOL! Throughout her book, Shonda talks of how she is petrified to do most anything. Here she is, an incredible writer who has a plethora of award winning televisions shows. These shows have broken barriers, have normalized people from all walks of life by putting characters on television that represent all people from all walks of life. She talks about how her fear stopped her from doing many things, things that could have made her life richer, more full, complete, but becasue she was afraid, she didn't do them. In one chapter of the book, Shonda Rhimes talks of how she gave a speech at the Human Rights Campaign Gala addressing this exactly thing...feeling alone. If you think about it, we are never alone. There are always people around...we are surrounded. The key is that we often don't have people around us that we feel connected to...our people. Each of us needs to look around and recognizing that we all have people. Each one of us has a tribe, we just need to look for them. 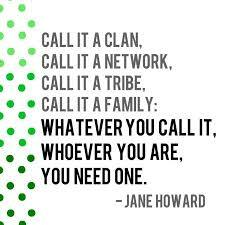 FInding your tribe means sifting through friends (or so called friends) and finding those who are your ride or dies. These are the ones that are there for you, through the crazy and sane times. The ones that hold you up when you can't stand on your own, the ones that, no matter what, can be counted on. We must surround ourselves with those who understand us. This means we must examine those who we have entrusted. Sometimes we have put our faith in some who we shouldn't. These are people we have allowed in who have presented themselves as friends, tustworthy, caring, and having our best interest at heart. Over time, their true selves appear, and we see that we must move on, leave those relationships behind, even if it is painful. We must put ourselves first and find out tribe. Surrounded by those who care about us, care about our well-being, want to lift us up, means that we can fully grow. We can become the people we were meant to be, fully blossoming into the incredible people that can fully impact the world. We couldn't do this if we were alone. We're not...we must never let fear tell us that we are unimportant. We must never let fear control our thoughts. Each of us is a powerful being, strong, beautiful and amazing. Remember...you are not alone. We've got this!